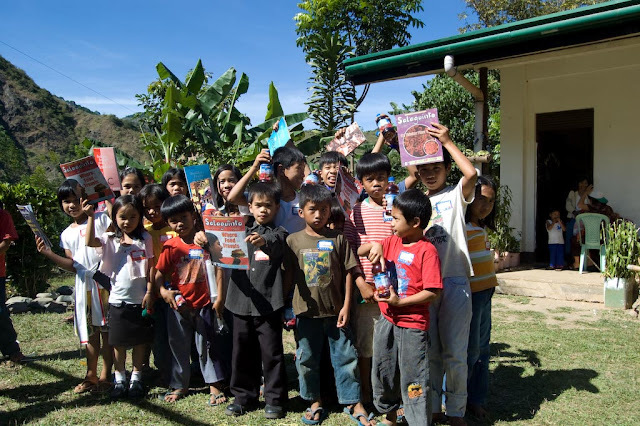 In December 2007, instead of a birthday party, my friends and I decided to organize an outreach program in one of the isolated communities in Itogon, Benguet. We are mountaineers and we felt it was nice to give back to communities in the mountains, that have shown nothing but goodness to us mountaineers. We presented a good proposition to our friends who we invited to join our first project. 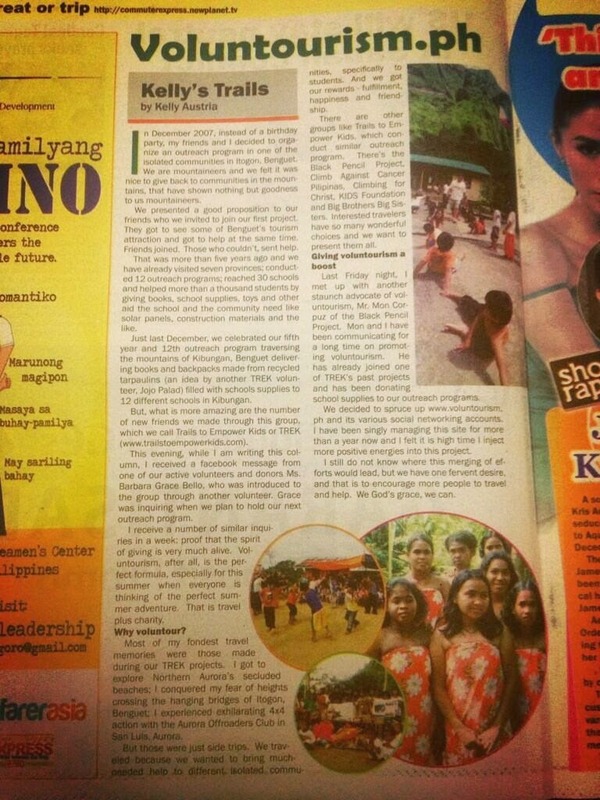 They got to see some of Benguet’s tourism attraction and got to help at the same time. Friends joined. Those who couldn’t, sent help. That was more than five years ago and we have already visited seven provinces; conducted 12 outreach programs; reached 30 schools and helped more than a thousand students by giving books, school supplies, toys and other aid the school and the community need like solar panels, construction materials and the like. Just last December, we celebrated our fifth year and 12th outreach program traversing the mountains of Kibungan, Benguet delivering books and backpacks made from recycled tarpaulins (an idea by another TREK volunteer, Jojo Palad) filled with schools supplies to 12 different schools in Kibungan. But, what is more amazing are the number of new friends we made through this group, which we call Trails to Empower Kids or TREK (www.trailstoempowerkids.com). This evening, while I am writing this column, I received a facebook message from one of our active volunteers and donors Ms. Barbara Grace Bello, who was introduced to the group through another volunteer. Grace was inquiring when we plan to hold our next outreach program. I receive a number of similar inquiries in a week: proof that the spirit of giving is very much alive. Voluntourism, after all, is the perfect formula, especially for this summer when everyone is thinking of the perfect summer adventure. That is travel plus charity. Most of my fondest travel memories were those made during our TREK projects. 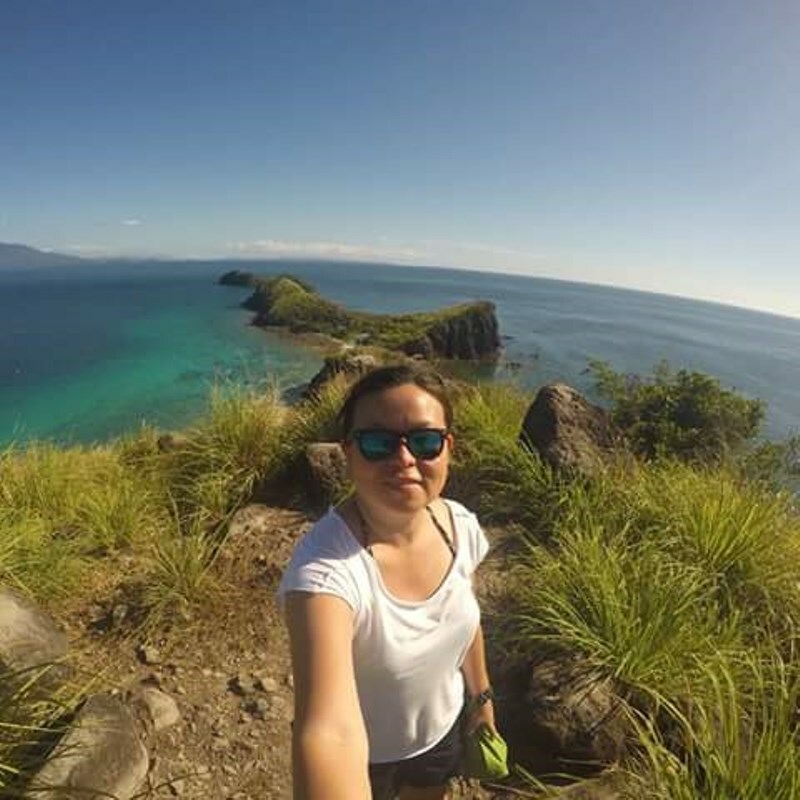 I got to explore Northern Aurora’s secluded beaches; I conquered my fear of heights crossing the hanging bridges of Itogon, Benguet; I experienced exhilarating 4×4 action with the Aurora Offroaders Club in San Luis, Aurora. But those were just side trips. We traveled because we wanted to bring muchneeded help to different isolated communities, specifically to students. And we got our rewards – fulfillment, happiness and friendship. There are other groups like Trails to Empower Kids, which conduct similar outreach program. There’s the Black Pencil Project, Climb Against Cancer Pilipinas, Climbing for Christ, KIDS Foundation and Big Brothers Big Sisters. Interested travelers have so many wonderful choices and we want to present them all. Last Friday night, I met up with another staunch advocate of voluntourism, Mr. Mon Corpuz of the Black Pencil Project. Mon and I have been communicating for a long time on promoting voluntourism. He has already joined one of TREK’s past projects and has been donating school supplies to our outreach programs. We decided to spruce up www.voluntourism.ph and its various social networking accounts. I have been singly managing this site for more than a year now and I felt it is high time I inject more positive energies into this project. I still do not know where this merging of efforts would lead, but we have one fervent desire, and that is to encourage more people to travel and help. We God’s grace, we can.